The Adams River sockeye run is known around the world as a miracle of nature. Sockeye salmon that have lived for four years in the Pacific Ocean make an epic 400km journey back to the streams where they where born. Their bodies change colour from silver-blue to bright red as they reach the spawning grounds. Many are caught or die along the way, but astonishing numbers reach their destination. How many are expected to make it back to the Adams River in 2010? More then 2 million! So make sure to check out the “Salute to the Sockeye Festival” in Roderick Haig-Brown Provincial Park near Chase, BC in October to view the incredible wildlife spectacle. 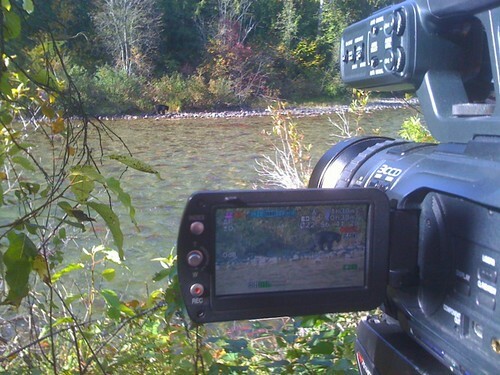 You may even spot a black bear having a salmon lunch! Tons of people gather to view the salmon and I met the increadiblly talented wildlife photographer Andrew Holland (guy in the video that is lying in the water snaping shots of the Sockeye) and you should see his amazing pictures here. This year was the first time I got to check out the Salmon Run. Considering its one of the biggest on record is awesome. Will go again next year!